and our job is to help you make the most informed and educated decision possible. The cost of your system, both total and out of pocket, varies greatly depending on the size of the system, the type of system you’re interested in, and the incentives/rebates your particular system qualifies for. Additionally, in assessing the cost for your particular home or business, there are many factors that come into play beyond just square footage—the number of occupants, their living habits, appliances in the home, etc., are all extremely important to the equation. It would be similar to asking “I drive a mid-size car… how much would I pay in gas per year?” There are many more questions that need to be answered. This is why we use information like your annual KWH usage and the potential location of the system on your property to gain a more accurate estimate of what your system cost will be. We also encourage customers to introduce energy-efficient apparatus to their homes (see technical details) to further capitalize on savings. Visit our Request a Quote page to submit some basic information that will allow us to quickly pull together a ballpark quote for your situation. We’d love to hear from you! Q: WHAT ARE SOME OF THE AVAILABLE INCENTIVES AND REBATES FOR MY SYSTEM? Right off the top, there is a 30% tax deduction on the total cost of your system from the Federal Government that is available for all systems installed before December 31st, 2019 (this gradually decreases starting in 2020 before leveling out at 10% in 2022 for commercial systems and going away completely for residential systems). In addition, many states offer a tax deduction of their own, and all these numbers are calculated the total cost of your system before any local grants and other incentives take effect. Commercial and agricultural systems are also eligible for depreciation, and many farms and rural small business installations qualify for a 25% grant from the USDA. All told, it’s not uncommon for a customer to pay less than 50% of the original price of the system, meaning fast payback times and many years of free energy. You can learn more by visiting our Incentives and Rebates page. Q: WILL MY ELECTRIC METER REALLY RUN BACKWARDS? On systems connected to a grid that utilizes Net Metering, yes, your electric meter will actually run backward when your system is producing more power than you are using (analog meters will spin in reverse, digital meters will show a minus sign). Net Metering allows solar owners to produce excess power and feed that power back onto the grid while receiving credit for their excess production. When they begin drawing down from the grid at night time, they draw from their “banked” production, and the net result is reflected in the customer’s electric bill. Sunny summer months will give you a large negative, and in the winter you will have an electric bill (although it will be substantially less than it would have been without solar)… all sized out to bring you to a net of zero for the year. And in most states, the utility will pay you for excess power generated (above your 100%) at a wholesale rate, usually up to 110%. (Because this is a wholesale rate, and because most utilities cut this off at 110%, there is a point at which it becomes economically impractical to oversize your system strictly for this benefit.) So on bright sunny days when the house is empty, your meter will more than likely be spinning happily backward. Q: HOW LONG IS A TYPICAL SYSTEM PAYBACK? Paybacks are calculated by dividing the post-incentive system cost by the client’s current monthly utility bill. Depending on the size of the system and which incentives you qualify for, payback times can be as short as a handful of years for commercial/agricultural systems and slightly longer for residential systems. But because energy costs are increasing, and will continue to increase in the coming years, there are still more uncalculated savings in your payback number that take place as a result of fixing your energy costs until the system is paid off. And since most solar panels are warrantied at maximum production for 25 years, many systems have several years of free energy sitting on the horizon. Q: WHAT ARE SOME WAYS I CAN REDUCE MY OVERALL ENERGY USAGE? Replace all incandescent light bulbs with CFL or LED bulbs. In general, CFLs are four times more efficient than incandescent bulbs and last up to ten times longer. LED bulbs are even more efficient and have a longer life than CFLs. It might not seem like much, but for regularly-used household lights, this switch can have a significant impact over the course of a year. Upgrade your refrigerators, freezers, and other appliances to newer, energy-efficient models(look for the Energy Star rating—it means they were manufactured with efficiency in mind). Again, these are upgrades that, with their reduced energy demand, will effectively pay for themselves just in the downsizing that will take place on your system. We sell all the items mentioned above in our Smucker’s Alternative Energy Showroom. Q: HOW DOES A SOLAR ENERGY SYSTEM WORK? It’s actually pretty simple—tiny photovoltaic cells within the solar panels convert sunlight to direct current (DC) power (like the kind in a car battery). From the panels, the power feeds into an inverter to convert it to alternating current (AC) power, which is necessary to run standard household appliances. The inverter is connected by wire directly to your home meter, which then feeds the power into your home just like it does power from the grid. The science is more complex than that, but from a step-by-step perspective, it’s a pretty straightforward process. Q: HOW DO I KNOW HOW BIG A SYSTEM I NEED? Part of the soup-to-nuts process for Smucker’s Energy is providing a free consultation to individuals interested in having a solar system installed. We ask the customer to provide their electric usage from the past year, and after some property surveying, we calculate an output number based on over three decades of sunshine data from your specific region. Using these results, we can determine how large a system you require to satisfy your energy needs for the next twenty-five years or more. Q: HOW DOES THE WEATHER IMPACT MY SOLAR ENERGY PRODUCTION? Because the basis for solar energy production is the sunshine, anything that reduces the amount of sunlight hitting the solar panels will reduce the total energy output of the system. This means that no power is generated at night, and power production is decreased by varying degrees during periods of cloud cover, rainfall, or snowfall. However, when calculating the size of the grid-tied system necessary to supply your annual energy needs, we use historical weather data for the last thirty-plus years in your region to account for the average sunshine in a calendar year necessary to generate the power your home or business requires. This way, even on rainy or snowy days when the sun is buried behind the clouds, you can rest assured that these days have been accounted for in your system size. Off-Grid systems are slightly different in their sizing since the removal of the utility requires that your system must be able to fully supplement your use during your energy consumption peaks (usually the winter months). Thus, since there is no utility for backup energy, an Off-Grid system designed to offset the same amount of energy would be a bit larger than its Grid-Tied counterpart. Q: HOW DURABLE ARE THE SOLAR PANELS? They’re pretty tough—today’s solar panels are designed to withstand extremely harsh conditions, such as winds over 50 miles an hour and hailstones more than an inch thick. The panel coverings themselves are shock and break resistant, and Smucker’s Energy uses high-quality panels and racking to ensure a very high-quality installation—our motto is Quality over Quantity. 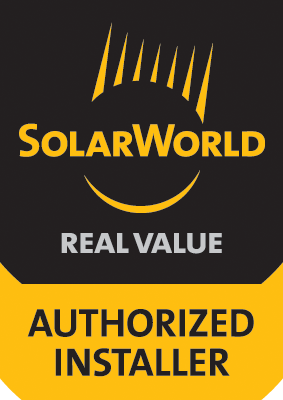 SolarWorld panels, made in America and Germany, have a 25-year production warranty that ensures that you receive the maximum benefit of every panel, with many years of slightly decreased production after that. In the end, it pays to install quality panels that can resist the harshest of conditions and will produce at a high level for decades. Q: WHAT KIND OF SOLAR ARRAY DO I NEED? There are three main types of solar arrays: roof mounts, ground mounts, and pole mounts (you can see examples of all three by viewing our Residential, Commercial, or Agricultural photo galleries). Which system type you choose is usually the result of some combination of budget, property/performance limitations, and aesthetic preference. Roof mounts are the most common, as they are inexpensive to mount because of the lack of excavation/construction and their proximity to the home meter. However, roof mounts do necessitate a few things—they need good southern exposure, an acceptable angle of incline, no shading, and a roof that is not in need of imminent repair. (If your roof does need repair, the time to do it is before you put on panels. Panels have actually been shown to protect and extend the life of a roof.) Ground mounts and pole mounts alike can be placed in high-sunshine areas and oriented and angled optimally (requiring fewer panels), but they are more expensive to install, and they necessitate ground area to accommodate however large a system you’ll need. However, if you possess the required machinery for ground installations and the skills to operate it, Smucker’s is willing to work with you to help keep down the costs. Whatever your situation, Smucker’s will work closely with you to find the perfect place for your system that is effective, efficient, and non-intrusive. Q: DOES MY SOLAR ARRAY NEED TO BE LOCATED IN An SHADE-FREE AREA? Yes, and here’s why: A typical solar photovoltaic panel is made up of many very small individual cells that are connected together in series (making one electrical path), and the power generated by each individual cell adds collectively to create the total output of the panel. Each cell must be in sunlight for it to produce energy—if any part of any cell is shaded, it affects the output of the other individual cells and the panel’s output as a whole. And since the individual cells are very small, what might seem like an insignificant amount of shade can, in fact, have a significant effect on the overall output of a panel. New technological developments have allowed additional components to be added to a system to significantly increase the efficiency of a partially shaded panel, but it is still far more efficient and economical to locate a solar array in a shade-free area. Q: DO I NEED A BUILDING PERMIT TO INSTALL A SOLAR ARRAY? Yes, you will need a building permit. As part of Smucker’s Energy regular installation service, we’ll take care of acquiring all necessary permits for our clients from their township or municipality. Q: HOW LONG DOES IT TAKE TO INSTALL MY SYSTEM? There are many steps to be taken in making the solar switch, so understanding the time needed for things like paperwork and grant applications is important in answering this question. As far as the actual installation time for the system itself, more than anything this is dependent on the size and complexity of your system and its location (both in terms of its accessibility on your property and traveling distance from our facility). Smaller systems, for cabins and average-size homes, can have the physical installation process completed in less than a week. For larger systems, like commercial or agricultural systems, this process can take several weeks. Smucker’s Energy promises that we will develop and execute the most efficient installation plan possible to help you start saving money right away, and we’ll completely handle the permit and application process to make your responsibility throughout the process as minimal as possible. Q: DO I NEED PERMISSION FROM THE POWER COMPANY TO CONNECT MY SYSTEM TO THE GRID? Absolutely. Each utility has its own rules for connecting to the grid, but it is universal that they all need to be contacted and their rules and regulations (as well as national electric codes and standards) be followed to the letter to safely and legally connect. This may sound complicated, but Smucker’s Energy has years of experience working with many utilities, and we take care of both receiving permissions to attach your solar system to the grid and working with the electric company to complete the connection and turn on the power. Q: IF I HAVE A GRID-TIED SYSTEM, WHAT HAPPENS WHEN THE POWER GOES OUT? A typical grid-tied system follows the electric company in the sense that the home will have power when the utility is operating normally, but if the power from the electric company is off for some reason (like a storm), then the home will not have power unless it is a hybrid system with a solar battery backup. The reason for this is safety—all grid-tied systems automatically disconnect from the utility if the utility has lost power to protect service people repairing the lines. Without this, a person working on the lines during a power outage would be at risk for an electric shock from the power being fed back onto the grid by solar energy systems. Q: DOES SMUCKER’S ENERGY GUARANTEE YOUR WORK AND PRODUCTS? Yes, we do, and we pride ourselves on doing quality work that ensures your solar energy system will give you many years of maintenance-free use. That commitment is reinforced with a five-year workmanship warranty on every solar install we do. Additionally, we only use quality, brand-name, and field-tested equipment— solar panels and inverters come with a minimum manufacturer’s warranty of 20-25 years for the solar panels and ten years for many inverters. Our wind generators come with a two-year workmanship warranty, plus a five-year manufacturer’s warranty on the small wind generators and a ten-year manufacturer’s warranty on the large wind generators. Most of the manufacturers we work with also have extensions available on their product warranties. You can learn more about our quality guarantees and our company principles on the About/Contact page. Q: WHAT IS THE DIFFERENCE BETWEEN OFF-GRID SYSTEMS AND GRID-TIED SYSTEMS? The main difference between the two is that grid-tied systems are connected to the local utility grid, while off-grid systems operate independent of any electric utility and store their energy in batteries. When you turn on your lights or use other appliances that contribute your building’s load, the power is then drawn from the battery bank. Unlike grid-tied solar systems, which feed power back onto the utility grid (essentially using the local utility as the battery), off-grid systems allow you to disconnect completely by directing the power generated by your panels into the battery bank, which supplies energy to all the loads connected to your electrical panel—thereby removing the need for a utility connection. For more information on Smucker’s Off-Grid systems, click here. Q: WHAT ARE SOME WAYS I CAN REDUCE MY ENERGY USAGE FOR AN OFF-GRID SYSTEM? Upgrade your refrigerators, freezers, and other appliances to newer, energy-efficient models(look for the Energy Star rating—it means they were manufactured with efficiency in mind). Again, these are upgrades that, with their reduced energy demand, will effectively pay for themselves just in the downsizing that will take place on your system, both in panels and batteries. Utilize direct current (DC) lighting. Because solar systems generate DC power, and most standard household appliances run on alternating current (AC) power, an inverter is necessary to convert DC power to AC for home use. But inverters are not 100% efficient, so furnishing a cabin to run on DC power would eliminate the cost of an inverter and increase your usage efficiency to reduce the size of system you require. Q: WHAT INFORMATION IS NEEDED ABOUT MY ENERGY USAGE TO ACCURATELY SIZE MY OFF-GRID SYSTEM? Major household appliances, such as refrigerators, freezers, dishwashers, stoves, washing machines, and dryers. Entertainment/business electronics, such televisions, computers, printers, and gaming consoles. Home comfort appliances, such as space heaters, air conditioners, and hot water heaters. …and of course, any other items that could represent a noticeable portion of your energy consumption. Your system is sized to accommodate your highest level of potential usage, so it’s important that we have all the information necessary to supply you with a solution that accomplishes that. Q: WHAT IF I ONLY AT MY CABIN (OR OTHER LOCATION) PART OF THE YEAR? If you want solar at a location that is not a permanent residence, your system can be easily sized to accommodate your average energy usage. Utilizing a battery bank system is helpful in this scenario, as it will store the power generated by your system when you are not present and stand ready to power your building as soon as you arrive. Smucker’s has plenty of experiencing designing and installing these types of systems, and we even work with two custom cabin-makers (Zook Cabins and Stoltzfus Structures) for individuals who are in the market for a completely customized solar/cabin setup. It’s very important, when sizing out these structures, that we have accurate estimates of energy used to generate a correctly-sized system. Simple things, like the exact number of standard appliances (fridge, freezers, washer/dryer, kitchen appliances, etc. ), are very important in generating an accurate load analysis. There’s even a big difference between watching one hour of TV per day or four—it all adds up. We need honest estimates of watt hours so that we can convert them to amp hours for our measurements. In the end, it’s all to make sure that you get the system you need while saving as much money as you can. All the answers to your basic financial and technical solar questions can be found here, and for everything else, feel free to contact us by phone (717.768.7777) or by email (info@smuckersenergy.com).